Do you know what Polimva is? 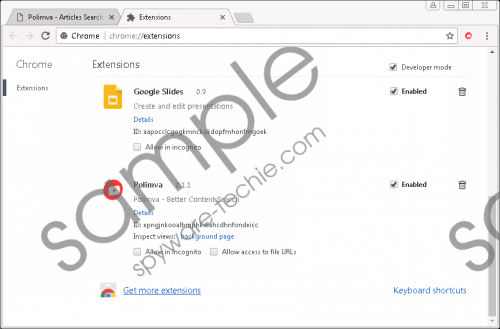 You may realize that your default search provider has changed in your Google Chrome browser after Polimva, a new extension, is installed. Although we cannot claim that this tool is a severe direct threat to your computer or to your personal information, it is possible that you can be introduced to potentially unsafe content on modified search results pages. Therefore, our researchers have categorized this extension as a potentially unwanted program, or PUP for short. Since this tool can enter your system along with malicious software installers, it is possible that your PC is facing multiple security threats right now. We believe that it is best for you to remove Polimva from your browser but first, let us explain to you why we think so in order for you to be able to make the right decision regarding this potential risk. User reports and our research indicate that it is more likely that you install this PUP while installing a free software bundle you download from questionable sources. You can easily end up with a bundle packed with all kinds of PUPs and malware infections (e.g., adware, browser hijackers, and fake alerts) if you click on unsafe third-party pop-up ads, for example. You may see an ad popping up while you are browsing and it may either promote this browser extension or something totally different. It is possible that this ad draws your attention and you click on it to install the offered tool. But you may not realize that, at the same time, you also let certain browser setting changes take place in the background and that is how you may end up with a new default search provider without noticing it. The only reason anyone would install this extension on purpose is probably that it promises you trending and viral content as well as better web search ability. Well, this PUP displays an icon in your toolbar, which shows a pop-up window if you click on it. This window contains a few thumbnail links to allegedly top trending articles on the web as well as a search tool at the bottom. This search tool redirects your queries to search.yahoo.com; however, before you arrive there, it may modify the search results with its affiliates’ advertisements and sponsored links. This is exactly how the default search engine, search.polimva.com, promoted by this PUP works. Unfortunately, you can be exposed to questionable third-party content this way as this tool may only generate revenue in this way, i.e., promoting any third party they just can, which always means that there could be ones not to be trusted. Unfortunately, even cyber criminals may be able to exploit such a tool to promote their malicious fake websites. This is how you might be introduced to such ads and links that can infect you with more threats or scam you by tricking you into disclosing your personal or banking details. Crooks can use your personal information, for example, to commit online frauds in your name and they can also drain your bank account if you are not careful enough. Although these are really the worst case scenarios that might happen, we still believe that it is the best for you to remove Polimva from your computer. Fortunately, you can put an end to this PUP quite simply if you follow our instructions below. Even if you are an inexperienced compute user, you can perform these steps in a minute. But you cannot forget about the rest because it is quite likely that you will find a number of other threats on your system. Apart from avoiding suspicious websites and clicking on third-party ads, you can also help your security by updating your programs and drivers frequently enough not to let cyber criminals gain access through exploiting outdated security bugs in your software. If you want effective defense for your PC, we advise you to install a decent anti-malware program, such as SpyHunter. Tap Alt+F to display the menu and navigate to More tools. Find the unwanted extension in the list and click on the Trash can. Polimva is a new extension that only seems to work on Google Chrome yet. This tool claims to provide you with better content search capability and trending content, but, at the same time, it may also pose a threat to your system security through the questionable third-party content it may present to you by showing altered web search results. In fact, this extension could be installed via questionable freeware bundles that could contain malicious programs as well. Therefore, it is essential that you scan your system for malware threats right after you remove Polimva as a potentially unwanted program. For best protection, we suggest that you install professional anti-malware software. Tags: delete Polimva, Polimva, remove Polimva.